Here it is, Economy Candy. Check out the colorful front windows. It's a collage of colorful candy boxes! The store's open, let's go inside and check it out. It's a long narrow store packed with candy-loving people. This is the original scale from when they first opened. Beneath the scale is scoopable candy that brings back memories of penny candy stores. How great to see candy cigarettes! I thought they stopped making them in this politically correct world, but in Economy Candy, it's like a trip back to a sweeter time. Here's a bucket of colorful swirly pops. With Easter less than a week away, I knew I'd see some Peeps in here and here's a pile of the spongy bunnies. And here's some Peeps with chocolate on the bottom. For some reason that makes me think of yesterday's post, but that's just me, my mind tends to wander. Let's just move on. A shot from the back of the store. Some signature chocolate lollipops on display. There's jars and bags behind the counter with more candy than the mind can comprehend. Delicious hand-dipped chocolates can be bought by the pound here at this glass counter. In addition to candy, they also sell vintage toys, gumball machines and other tchotchkes. A Sock Monkey lunch box is neighbors with Batman on a shelf in the store. Here's a display of specialty Pez dispensers. Stars, they eat candy too! Here's a photo of Mike Myers on the wall with owner Jerry Cohen. And here's Jude Law with Jerry the owner. From the look on Jude's face, it looks like he's sucking on a sour ball. It's the owner, Jerry Cohen. Here he poses by a black and white photo of him and his father who started the store in the East Village back in 1937. I asked Jerry when he started working in the store and he told me, "When I was born." Walking around in the store is like a time warp and makes you feel like a kid again. Nice to know there's a sweet store in the East Village that will send you back to a time when candy would make everything better. Further Reading and Watching: Village Voice, Shecky’s (Fourth entry) and Rocketboom. It really, really doesn't mean a thing. Oh man, YES!!! I love economy candy! Haven't been in a while but may need to go there and pick up a pack of candy cigarettes... unless bloomberg taxes the heck out of those as well. What a great family-run company!!! Seeing all those delicious goodies my blood pressure rises to astronomical levels. Think I'll just look. what a great store! nice to see a business like this thriving, willy wonka would be proud! Wow! That's some serious sweets! I always loved those Bit o Honeys. And the candy cigarettes remind me of the good ol' days. But those giant Pez dispensers look like trouble. I imagine the candies for those are gigantoid and, considering the fact that I have to eat the entire sleeve every time I pick up a dispenser, I believe owning one of those may be the end of me. What a way to go, though. TO: PEZ! @Lindsay: I've been meaning to check out Economy Candy for years and glad that I finally made the trip! Your Bloomberg tax statement on the candy cigarettes is too funny! Hopefully he'll leave them alone! @Mykola Mick Dementiuk: Sorry about the blood pressure rise! Maybe I should put up a medical warning to accompany this post! @Bobby D: The store made me think of Willy Wonka too! Jerry Cohen is the modern day Willy Wonka! @Biff: I checked and the giant Pez dispensers dispense the regular size, so you're safe! TO PEZ! Great to see a real candy store. As a teenager back in California I was always into Reese's peanut butter cups and I liked them frozen,, many cavities later, I finally went to rehab and they got me off the stuff,,,,,,lol. Must say that I haven't thought about the movie "Candy" in a really long time. Marlon Brando and Ringo Starr,,,,,but the girl? 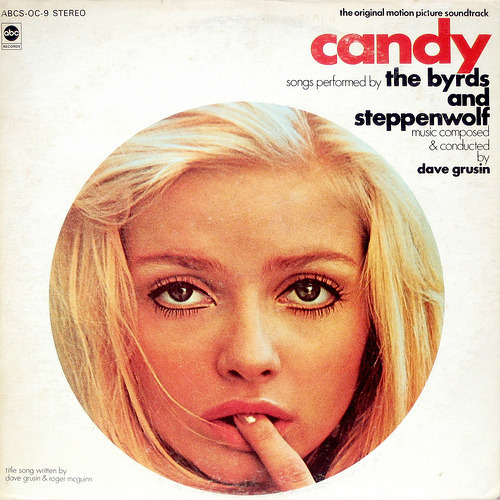 Candy was played by a Swedish beauty named Ewa Aulin, she made more movies during that time but she quit and started a family,,,,now I must find this movie,,,,thanks for reminding me. Jude Law has that, "I don't particularly care for candy, my wife detests candy, my babysitter adores candy, maybe I shouldn't have my photo taken in public. ", expression on his face. This is one of the best businesses in the city! Everyone should go there at least once. And, look how happy the owner is - the store oozes fun and happiness! Candy was forbidden to me as a child and, even as an adult, I feel like I'm getting away with something when I go in there. It really is an over-the-top experience. And, for some reason, I always have to buy some of those candy cigarettes. I don't smoke and I don't eat them, just like to collect the boxes. Those are things you just don't see anymore. @Al: I always liked freezing candy too, and some stores would sell frozen peanut butter cups, a great summer treat! I need to watch Candy again too, a classic movie! @csp: Mentioning Jude Law's babysitter reminds me that he got caught with his hand in the candy bowl! @roadsidewonders: Glad you loved it, candy always puts everyone in a good mood! @Goggla: It really is a great store and Jerry the owner is a real nice guy. Always great to see family-owned businesses like this! And I loved seeing those candy cigarettes in there! @Jaws: Put some chocolate sauce on that pancreas, eat it and maybe it'll grow back! Ahhh, Peanut butter MaryJanes by the pound. It's stores like that one that gave me plenty of cavities & 2 root canal's. If I had to do it all over again, I'd probably still be in line with the other kids after school counting up my pennies to see what kind of sugar shock I was gonna get that day to ruin my dinner. I remember my Mom always saying, come straight home & don't stop at the candy store. @Danny the Freelancer: As a kid we'd smoke Mary Jane and then eat Mary Jane candy! And my mom used to say the same thing to me, but I always stopped! Sweet memories! @JHwang: That sounds good, if I had a stove I'd try it. Maybe I need to get a Fry Daddy! I was raised by an extended family from about age 8 to age 12, and mostly by VERY strong and independant women. My Great Aunt Madeline Shea was one of my favorites. She had lived in the Village back in the 1920s/1930s, and she was fond of taking roadtrips with me in tow back to the city of her youth. So on one of our roadtrips from Toronto/Cleveland when I was about 10 years old (1960), we were absolutely ripping thru the city...NYLibrary, Central Park, museums, REALLY wierd art galleries, funky coffee shops (Huh? WHAT'S a "coffee shop" Maddie?.....remember.....I'm TEN!). But here's the thing......later that night we end up at a diner someplace around Radio City. While we are eating, in comes a rush of women dressed in all kinds of fairly revealing costumes on a break from their part of a show. (Don't think it was the actual Rockettes, just some extras maybe from some play). Not only that, but MY Aunt is actually talking to some of them like they are old friends, and I'm getting the "How cute" compliments 'cuz I was kinda dressed up. WELLLLL, it was an eye-opener for this little cowboy, let me tell 'ya!!! Not exactly sure what all my feelings were at the time, but I KNEW I was IN LOVE with at LEAST a third of the ladies......"take me home with you NOW!.....please". Two things struck me about this incident within a couple of years. First, and I'm SURE you saw this one coming......actual candy = NO! ; eye candy = wotthehell, it's New York kid. But second, I FINALLY put it together that Aunt Maddie worked for many years at the Rountree candy factory in Toronto, and THAT'S why she gave me the "candy lesson".......she most likely would have been happy to have not seen another piece of candy for the rest of her life. GOD, I miss her! I like a good Mars Bar! As a long time East Village resident, I've treasured this candy store for years! You got some great photos and really captured the friendly vibe of the place. Jerry's always got a smile for everyone and treats the customers great! Great work! @DrBOP: Great story! Too cool that you saw Economy Candy! Sorry you didn't get to sample the candy, but it sounds like your eye candy made up for it! @Marianne Faithull: That’s what I’ve heard! @Candy Darling: Say hi to Lou and then go take a walk on the wild side. @East Village Resident: Glad you liked the post and I'm happy you feel I captured the vibe of that place. It really puts you in a good mood from the moment you walk in! Oh man! I have always LOVED candy cigarettes. I can't find those any where! Candy Cigarettes a BLAST from the past! What an amazing candy store! Does anyone remember the Ice Cube candy chocolates? They were chocolate candies that were square like ice cubes and they were delcious! I would love to find those somewhere some time. I love going here! Great place to buy treats for people & to wallow in childhood memories. And as a kid, loitering about, trying to look cool with those cigarettes ... The best! guess who's now officially a Senior Citizen? Yep, it's your favorite Uncle. Just signed up for retirement benefits. Starting in August, I'm gonna get an extra buck three eighty for imported beer. Unfortunately, I already spent the first 3 checks at the I-Bar. At least I made it home...I think. @Meleah: You know where to get them now! @Tiki Bar Susie: I loved Ice Cubes! I didn't see any on this trip, but will ask the next time I'm in there! @onemorefoldedsunset: It really does bring back a floodgate of memories! @Uncle Waltie: Congratulations! No one deserves the extra dough more than you! Sip Ahoy! @tehennessey: The prices on everything in there are great! If you ever get out here, I'll take you there! I don't eat candies, but seeing all these old-time sweets makes me nostalgic. PS I used to buy the sour straws after school in my childhood. 5 cent per straw. Cheap yo. Just wow. That post teleported me back to childhood, at least in spirit. Always liked the Big League Chew - bubblegum shredded like chewing tobacco in a resealable pouch. Pure heaven for a baseball fan. @kim: If only there were beer in there too, it would be heaven! I think I saw some of those sour straws in there yesterday! @DaveW: It's amazing to see the smiles on everyone's faces in here. The kids are beaming because there's more candy than they've probably ever seen and the adults are smiling at childhood memories. A fantastic place! Great post Marty. I love old-school candy, and Easter candy in particular. It's the sugar highlight of the year. @Fat Al: If you love old-school candy, you need to check this place out!